Summer has given way to Autumn as the air fills with the anticipation of cozy weather. The heat and humidity will not be missed. I am ready for a change in seasons. In fact, I am doing a rain dance, praying for chilly evenings . But the sweet harvest of the warm months will be difficult to forget. Luckily, there are still a few fresh peaches in the fridge. Every trip to the market includes a stop by the peach bin, where I shamelessly hold a peach up to my nose for a sniff. Daisy watches carefully and takes note. She helps me pick the good ones. If the peach has no fragrance, it’s probably not going to have any taste either. That’s my test.We grab as many as we can carry and make a mad dash for the cash register. On the way home, we talk about all the things we are going to bake with our newfound bounty. As I pull in to park behind our garage, I snap my seatbelt loose only to earn a lecture from my pint-sized companion about motor vehicle safety practices. While I fumble with all the bags of groceries, Daisy runs into the house, straight to the kitchen, commanding me to cut a peach into slices for her. There’s nothing better than sweet fresh peaches. Luckily, a few have managed to survive in the fridge and we agreed to work them into something baked. Daisy ran to the garden and picked some of the lemon thyme Daddy has planted for us. I grabbed the mascarpone from the fridge and the gorgeous avocado honey we got in Cambria. Something very special came together without even bothering Mr. Oven. We put my favorite kitchen gadget to work for a raw, decadent dessert, Torched Peaches with Mascarpone and Avocado Honey. And, while our li’l treat certainly sounds posh, there is nothing complicated about making it. There is very little prep-work. You can wash fruit, can’t you? Then, this one’s for you. Wash peaches, halve and remove the pips. Dab cut side dry with a paper towel. Use a torch to caramelize the tops. Combine mascarpone, brown sugar and vanilla. Spoon into the pip crater of each peach half. Sprinkle the tops with lemon zest, fresh thyme leaves and a general drizzle of honey. Our trip to Cambria several months ago sparked the idea for this lovely dessert when I found avocado blossom honey at The Garden Shed, one of my favorite stops. I never even realized that avocado trees had flowers that would drawn the attention of bees. The flavor of this honey is more mild than typical clover honey and the sweetness more tame, making it a great addition to any dish, really. 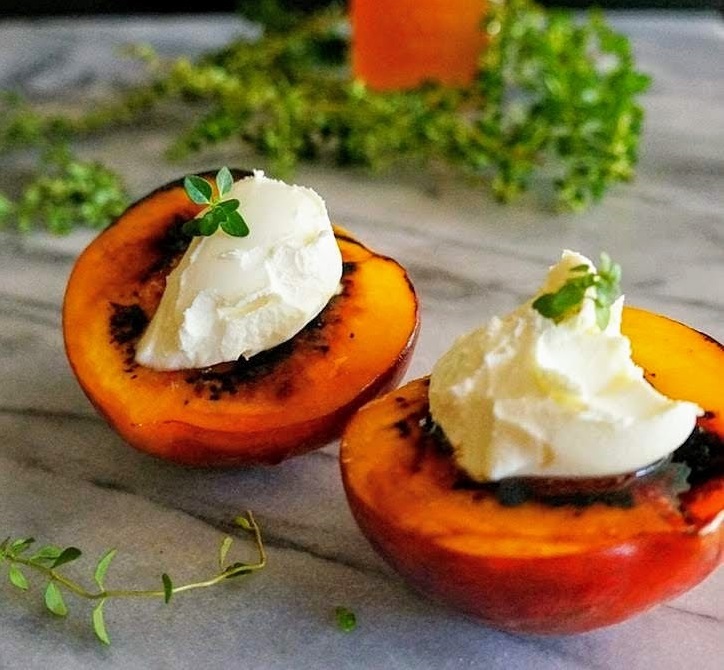 With just a short list of ingredients and no cooking or baking required, these seared peaches pair beautifully with cool, creamy mascarpone cheese and sweet honey. Make sure you grab a plumber’s torch from your nearly home improvement store. Fresh thyme adds just a bit of fragrant spice to the mix, making it a seemingly rich, yet luxuriously light finish to supper. Serve these sweeties with your favorite bubbly and dazzle your guests. Fall may officially be here, but the mercury just keeps rising, at least for us poor souls in Southern California. For now, we will dream of falling leaves and chilly breezes as we enjoy that last kiss of summer. That plumber's torch brought a smile to my face. Those peaches look divine! These peaches look decedent and SOOOOO devour-able!! I love that thing. My husband got it for me. You should see the meringue it makes! Thanks. Hope you get to enjoy this before the peaches disappear. Dear Colette, unfortunately my kitchen torch is a bit out of order these days but that does not mean that I could not broil some peaches and prepare this very elegant and no-fuss, late-summer kind of dessert for us! Hi Coco, how cool is it that your Daisy is smelling the peaches to see if they are okay or not, so sweet! I just love this idea!!!! It's fancy enough to feel sophisticated but it sounds accessible, and I love the flavor combo.